Plants are regularly victims of infections by pathogens, particularly by fungi. 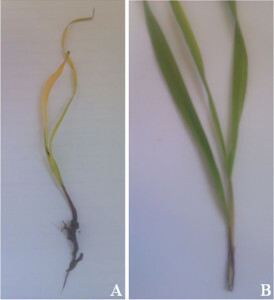 Crops as barley could be infected by phytopathogenic Fusariumspecies (Fig. 1) what triggers a lot of damages and money cost. The Fusarium fungi have the particularity to synthesize various mycotoxins in planta to succeed their infection. In our research, we aimed to understand the physiological impact on the plant cell triggered by an important mycotoxin: deoxynivalenol (DON). We choose to work on a very useful lineage of plant cell, the Nicotiana tabacumBright Yellow 2 (BY2). This cell culture is undifferentiated and “immortal” because the culture survives for a long time just thanks to a regular sub-cultured. Early events induced by the toxin deoxynivalenol lead to programmed cell death in Nicotiana tabacum cells.